A sesamoid is a bone embedded in a tendon. Sesamoids are found in several joints in the body. In the foot, the sesamoids are two pea-shaped bones located in the ball of the foot, beneath the big toe joint. Acting as a pulley for tendons, the sesamoids help the big toe move normally and provide leverage when the big toe “pushes off” during walking and running. 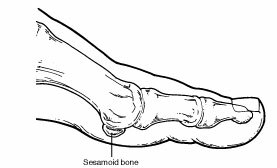 The sesamoids also serve as a weightbearing surface for the first metatarsal bone (the long bone connected to the big toe), absorbing the weight placed on the ball of the foot when walking, running, and jumping. Sesamoid injuries—which can involve the bones, tendons, and/or surrounding tissue in the joint—are often associated with activities requiring increased pressure on the ball of the foot, such as running, basketball, football, golf, tennis, and ballet. In addition, people with high arches are at risk for developing sesamoid problems. Frequently wearing high-heeled shoes can also be a contributing factor. Turf toe. This is an injury of the soft tissue surrounding the big toe joint. It usually occurs when the big toe joint is extended beyond its normal range. Turf toe causes immediate, sharp pain and swelling. It usually affects the entire big toe joint and limits the motion of the toe. Sometimes a “pop” is felt at the moment of injury. An acute fracture is caused by trauma—a direct blow or impact to the bone. An acute sesamoid fracture produces immediate pain and swelling at the site of the break, but usually does not affect the entire big toe joint. A chronic fracture is a stress fracture—a hairline break usually caused by repetitive stress or overuse. A chronic sesamoid fracture produces longstanding pain in the ball of the foot beneath the big toe joint. The pain, which tends to come and go, generally is aggravated with activity and relieved with rest. In diagnosing a sesamoid injury, the foot and ankle surgeon will examine the foot, focusing on the big toe joint. The surgeon will press on the big toe, move it up and down, and may assess the patient’s walking and evaluate the wear pattern on the patient’s shoes. X-rays are ordered, and in some cases, additional imaging studies—such as a bone scan or MRI—may also be needed. Immobilization and nonweightbearing. The foot may be placed in a cast or removable walking cast. Crutches may be used to prevent placing weight on the foot. Physical therapy. Sometimes the rehabilitation period following immobilization includes physical therapy, such as exercises (range-of-motion, strengthening, and conditioning) and ultrasound therapy. Surgery is generally reserved for the most severe sesamoid injuries which fail to respond to non-surgical treatment over a long period of time. In these cases, the foot and ankle surgeon will determine the type of procedure that is best suited to the individual patient.